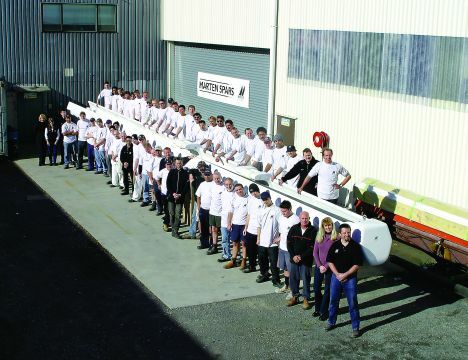 The New Zealand company Marten Spars specialises in design and production of masts and booms in carbon fibre, to be used on extreme sailing boats or large yachts. The advantages deriving from the use of carbon fibre in the production of masts and booms subject to particularly heavy workloads are mainly linked to the capacity of this material to guarantee minimised weights with connected advantages for mass distribution and therefore stability. Carbon has also proven to be more suitable than aluminium as it ensures a constant ideal shape to the sails, with an important increase in power, as well as being considerably more resistant to strain compared with aluminium. Marten Spars works continually in connection with boatyards busy in the production of sailing super-yachts to design rigs suitable for each single yacht, be it a large motor sailer or a regatta boat like those taking part in the America's Cup. Mention of these two kinds of boats is a must as among the prestigious work completed by Marten Spars we have the rig produced for a 47.5 metre motor sailer that can be engine powered up to a speed of 25 knots, factor that causes the deck fitting out to undergo very high mechanical stress. Furthermore, Marten Spars produced the masts and boom for KZ1 and NZL20, two New Zealand boats that became part of the history of the America's Cup. Among this Kiwi company's clients there are boatyards such as Alloy Yachts, Baltic Yachts, CNB, Jongert, Pendennis Shipyard, Royal Huisman, Vitters and other prestigious yards involved in the production of large sailing yachts. On occasion of the Ft. Lauderdale Boat Show in 2002, the International Super-yacht Society conferred International Super-yacht Design Awards on "Only Now" by the CNB boatyard, "Borkumriff IV" by Royal Huisman and "Squall" by Perini Navi. "Only Now" and "Squall" had been fitted out with boom and complete rig in carbon fibre by Marten Spars. Other prestigious yachts supplied with rig by Marten Spars have received important awards such as, for example. "SYL" produced by Barcos Deportivos and winner at the Monaco Boat Show in 2002 of the Design Award. From the 8th October to 11th October 2003 Marten Spars was co-sponsor together with Doyle of a regatta held in Palma de Mallorca, with the participation of some of the world's most prestigious sporting boats. Six of the boats at the starting line of this regatta were equipped with rig by the Kiwi company. Marten Spars has 3,000 sq/m of production area, with high precision machinery for the processing of the raw materials and assembly, as well as a staff of 70 comprising technicians who work daily on the production and development of top performance rig. At the moment the company is producing nine large booms and five masts, all to be used on sailing super- yachts being built by the most important boatyards in this specific sector. For further information please contact: Marten Spars Ltd; 40 Ben Lomond Crescent - Pakuranga; Auckland (New Zealand); tel. +64 9 576 3573; fax +64 9 576 2150; website www.martenspars.com; e-mail office@martenspars.com.